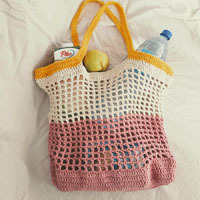 Go to original pattern for design DROPS 105-3. 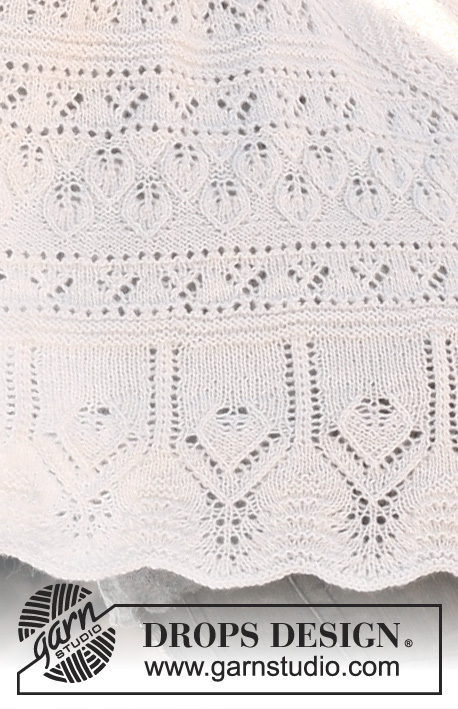 DROPS knitted shawl in “Alpaca” with various lace patterns. 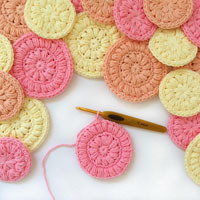 DROPS circular needle (80 cm) size 3 mm - or size needed to obtain 24 sts x 32 rows in stocking st = 10 x 10 cm. 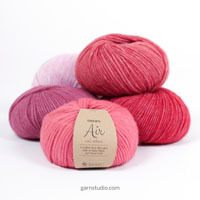 You can get the yarn to make this pattern from	25.60£. Read more. Pattern: See diagram M.1 to M.5 and X.1 to X.4. The diagram is seen from the RS. Inc at beg of row: Work 3 garter sts, K1, 1 YO, K1. On return row from WS work these sts as follows: P3, 3 garter sts. Inc as follows mid back: Beg 2 sts before marking thread (= MT), K1, 1 YO, K1 (= st with MT), 1 YO, K1. On return row from WS P these 5 sts. Inc as follows at the end of row: beg 5 sts before the end of row: K1, 1 YO, K1, 3 garter sts. On return row from WS work these sts as follows: 3 garter sts, P3. Row 2: (= RS): P2, * 1YO, K1, 1 YO, P2, K5, P2*, repeat from *-* until 3 sts left on row, work these as follows: 1 YO, K1, 1 YO, P2. Row 3-5-8-9-11-13-16 and 17: Work K over K and P over P. P all YO. Row 7: K2, *P7, K5*, repeat from *-* until 9 sts left on row, work these as follows: P7, K2. Row 10: P2, 1 YO, K1, 1 YO, P2, slip 1 st as if to K, K1, psso, K3, K2 tog, P2, *1 YO, K1, 1YO, P2, slip 1 st as if to K, K1, psso, K3, K2 tog, P2*, repeat from *-* and finish with 1 YO, K1, 1 YO, P2. Row 12: P2, K1, 1 YO, K1, 1 YO, K1, P2, slip 1 st as if to K, K1, psso, K1, K2 tog, P2, *K1, 1 YO, K1, 1YO, K1, P2, slip 1 st as if to K, K1, psso, K1, K2 tog, P2*, repeat from *-* and finish with K1, 1 YO, K1, 1 YO, K1, P2. Row 14: P2, K2, 1 YO, K1, 1 YO, K2, P2, slip 1 st as if to K, K2 tog, psso, P2, *K2, 1 YO, K1, 1YO, K2, P2, slip 1 st as if to K, K2 tog, psso, P2*, repeat from *-* and finish with K2, 1YO, K1, 1 YO, K2, P2. Row 18: P5, *slip 1 st as if to K, K1, psso, K3, K2 tog, P5*, repeat from *-*. Row 19: Work K over K and P over P. At the same time inc 2 sts between each leaf, i.e. in the 5 K sts as follows (inc by picking up st from previous row): K1, inc 1 st, K3, inc 1 st, K1. Row 20: Work sts on each leaf as follows: slip 1 st as if to K, K1, psso, K1, K2 tog. P all other sts. Row 21: P the 3 sts on each leaf, K remaining sts, at the same time inc as follows between each leaf: K1, inc 1 st, K5, Inc 1 st, K1. Row 22: Work 3 sts on leaf as follows: slip 1 st as if to K, K2 tog, psso, P all other sts. X.1, M.1A (= 4 sts), M.1C (= 5 sts), X.2, 1 stocking st (= st with MT), X.3, M.1A (= 4 sts), M.1C (= 5 sts), X.4. After 1 vertical repeat of pattern there are 45 sts on row. Continue as follows: X.1, M.1A, M.1B (= 8 sts) repeated until 6 sts (this number of sts varies according to row number in X.2) remain before st with MT, work these sts as follows: M.1C, X,2, then work 1 stocking st (= st with MT), X.3, M.1A, M1.B repeated until 9 sts (this number of sts varies according to row number in X.4) remain, work these sts as follows: M.1C, X.4. Continue like this until you have worked 18 vertical repeats of M.1 = 317 sts on row. K 1 row from RS and P 1 row from WS. At the same time inc each side and mid back on every other row – see Increasing tip – until finished measurements. Continue in M.2. After 1 vertical repeat of M.2 there are 333 sts on row. K 1 row from RS, at the same time inc 8 sts evenly (in addition to inc at sides and mid back). P 1 row from WS, P 1 row from RS and K 1 row from WS. There are now 349 sts on row. Work next row as follows: 5 sts at side with inc as before, *K2 tog, 1 YO*, repeat from *-* until 3 sts before mid back, work these with inc as before, 1 YO, repeat from *-* until 7 sts remain, work these K2 tog and 5 sts with inc as before. K 1 row from WS, at the same time inc 2 sts evenly (in addition to inc at sides and mid back) = 355 sts on row. Continue as follows: 5 sts at side with inc as before, M.3 (= 9 sts) repeated on the next 171 sts, 3 sts mid back with inc as before, M.3 on the next 171 sts and 5 sts at side with inc as before. NB! Work inc sts at side and mid back in stocking st until M.3 is completed. After 1 vertical repeat of M.3 there are 379 sts on row. K 1 row from WS, at the same time inc 2 sts evenly (in addition to inc at sides and mid back) = 381 sts. Continue as follows: 5 sts at side with inc as before, * K2 tog, 1 YO *, repeat from *-* until 3 sts mid back, work these with inc as before, 1 YO, repeat from *-* until 7 sts remains, work these: K2 tog and 5 sts with inc as before. K 1 row from WS, P 1 row from RS at the same time inc 14 sts evenly (in addition to inc at sides and mid back) = 403 sts on row. Continue as follows: 5 sts at side with inc as before, Leaf pattern – see above – on the next 195 sts, 3 sts mid back with inc as before, Leaf pattern on the next 195 sts and 5 sts at side with inc as before. Note! 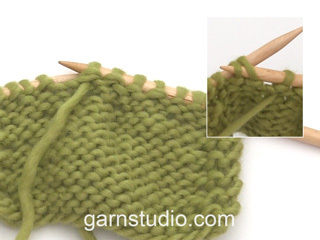 Work inc sts at side and mid back in reverse stocking st until row 10 in Leaf pattern. 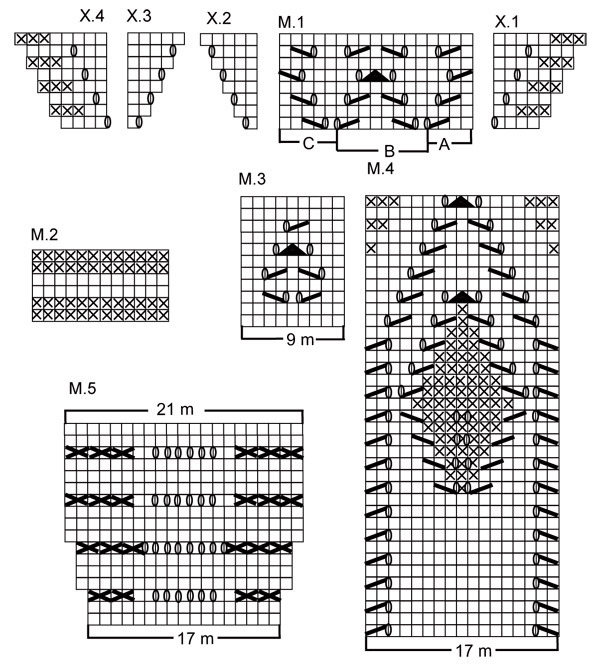 Now continue as follows: 5 sts at side with inc as before, Leaf pattern from row 10 – see above – on the next 198 sts, 3 sts mid back with inc as before, Leaf pattern on the next 198 sts and 5 sts at side with inc as before. NB! 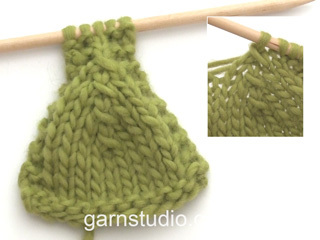 Work inc sts at side and mid back in reverse stocking st. After Leaf pattern is complete (= 22 rows) there are 455 sts on row. K 1 row from WS, at the same time dec 2 sts evenly = 453. P 1 row from RS and K 1 row from WS. There are now 457 sts on row. Continue as follows: 5 sts at side with inc as before, * K2 tog, 1 YO, repeat from *-* until 3 sts mid back, work these with inc as before, 1 YO, repeat from *-* until 7 sts remains, work these: K2 tog and 5 sts with inc as before. K 1 row from WS, at the same time inc 2 sts evenly (in addition to inc at sides and mid back)= 463 sts on row. Continue as follows: 5 sts at side with inc as before, M.3 (= 9 sts) repeated on the next 225 sts, 3 sts mid back with inc as before, M.3 on the next 225 sts and 5 sts at side with inc as before. NB! Work inc sts at side and mid back in stocking st until M.3 is completed. After 1 vertical repeat of M.3 there are 487 sts on row. K 1 row from WS, at the same time inc 2 sts evenly (in addition to inc at sides and mid back) = 489 sts. Continue as follows: 5 sts at side with inc as before, * K2 tog, 1 YO, repeat from *-* until 3 sts mid back, work these with inc as before, 1 YO, repeat from *-* until 7 sts remains, work these: K2 tog and 5 sts with inc as before. K 1 row from WS, K 1 row from RS, P 1 row from WS. There are now 497 sts on row. Now continue in M.2 (inc at sides and mid back as before). After 1 vertical repeat of M.2 there are 509 sts on row. K 1 row from RS, at the same time inc 10 sts evenly (in addition to inc at sides and mid back) = 523 sts on row. P 1 row from WS. Continue as follows: 5 sts at side with inc as before, M.4 (= 17 sts) repeated on the next 255 sts, 3 sts mid back with inc as before, M.4 on the next 255 sts and 5 sts at side with inc as before. NB! Work inc sts at side and mid back in stocking st until M.4 is completed. After 1 vertical repeat of M.4 there are 599 sts on row. P 1 row from WS, K 1 row from RS and P 1 row from WS. There are now 603 sts on row. Continue as follows: 5 sts at side with inc as before, K3, M.5 on the next 289 sts, K3, 3 sts mid back with inc as before, K3, M.5 on the next 289 sts K3 and 5 sts at side with inc as before. NB! Work inc sts at side and mid back in stocking st until M.5 is completed. After 1 vertical repeat of M.5 there are 771 sts on row. K 1 row from WS, K 1 row from RS and cast off loosely. 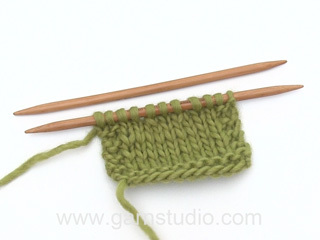 \\\"After Leaf pattern is complete (= 22 rows) there are 455 sts on row. K 1 row from WS, at the same time dec 2 sts evenly = 453. P 1 row from RS and K 1 row from RS. There are now 457 sts on row.\\\"
...= 403 sts on row. 5 sts at side with inc as before, sts between the 5 side sts and leaf pattern works in reversed stockinette st, Leaf pattern – see above – on the next 195 sts, 3 sts mid back with inc as before, sts between the 3 sts in the middle and the leaf pattern works in reversed stockinette st, Leaf pattern on the next 195 sts and 5 sts at side with inc as before, sts between the 5 side sts and leaf pattern works in reversed stockinette st. Note! 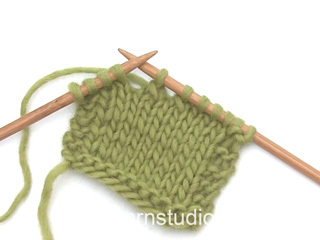 Work inc sts at side and mid back in reverse stockinette st until row 10 in Leaf pattern. Now continue as follows: 5 sts at side with inc as before, sts between the 5 side sts and leaf pattern works in reversed stockinette st, Leaf pattern from row 10 – see above – on the next 198 sts, 3 sts mid back with inc as before, sts between the 3 sts in the middle and the leaf pattern works in reversed stockinette st, Leaf pattern on the next 198 sts and 5 sts at side with inc as before, sts between the 5 side sts and leaf pattern works in reversed stockinette st.